Are your work stations, point of sale and IT equipment prepared for a power outage? As business demands for electricity continues to increase, electrical problems such as blackouts and brownouts will increase. These issues can be frustrating, cause loss of productivity and even require businesses to close. You can protect your business against these problems with an Uninterruptible Power Supply (UPS), which helps preserve power to your business and your essential processes during a power shortage or outage. But, where to begin? 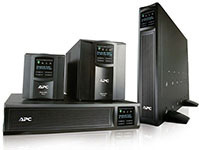 Not sure what type of UPS system or uninterruptible power supply you need? Titan Power is a distributor of single phase UPS systems . We sell, install and service all major brands. We offer a distinct advantage over both the manufacturer and competition, in that we can recommend the optimal, most efficient backup power solution for our customers. This differentiation allows us to be completely objective and unbiased in our recommendations and offers customers a single-source solution for their critical backup power. A UPS, or Uninterruptible Power Supply, serves as one of the easiest and most cost-effective methods of maintaining equipment uptime, alleviating a potential crisis situation in a power outage. As a backup power supply, the UPS will keep your network and computer systems up and running during a brief power outage or give you time to properly shut down equipment during an extended outage. UPS units provide a buffer against power supply interruptions ranging from a few minutes to an hour or more, depending on the size of the unit. Not sure what type of UPS system or uninterruptible power supply you need? Learn more about choosing the right system for your needs with a free project consultation. Or feel free to contact us at info@titanpower.com or call 800.509.6170. This entry was posted in Power Management, Titan Power, Uninterruptible Power Supply. Bookmark the permalink.